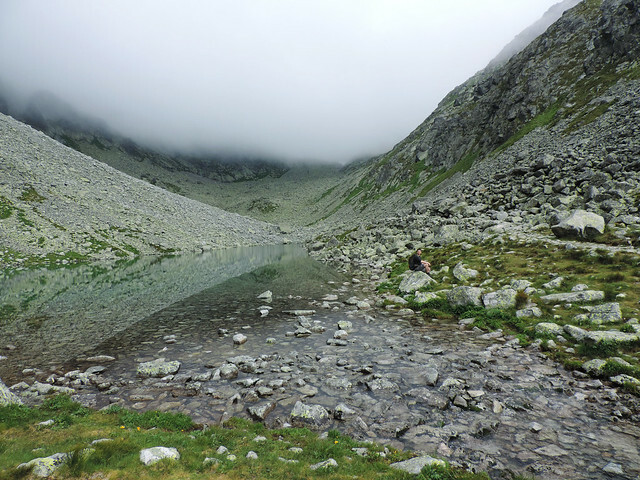 We already have two posts about two different “3 Lakes Trail” in Slovakia’s High Tatras. Well, here’s a third one. Of all the trails we explored there, this one seemed to be the least known. 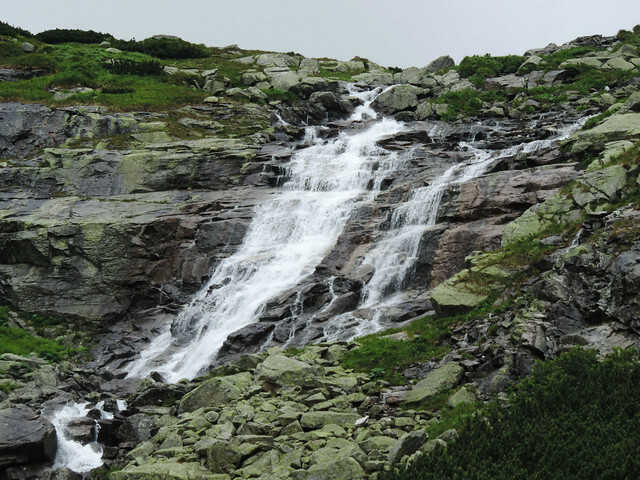 Starting from the village of Tatranská Polianka, this route actually leads far into the heart of the wilderness. 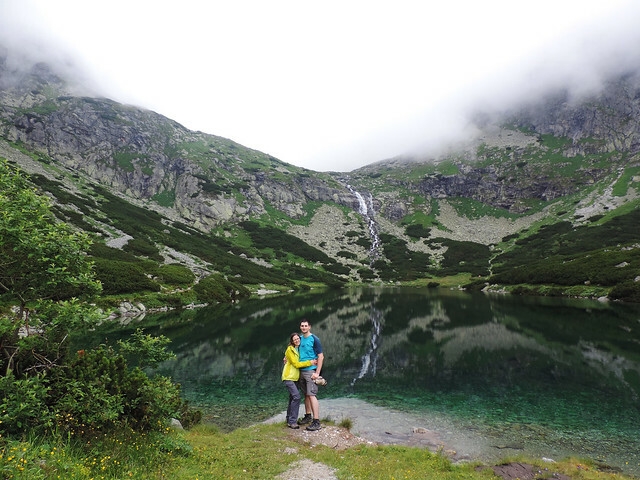 But we shortened it to the Velické pleso – Dlhé pleso – Zamrznuté pleso (yes, they are the 3 lakes) route so that we can do it as a day hike. It was a beautiful hike and one that we definitely want to do again. Because we actually haven’t seen the third lake. No, not because we didn’t have time or energy to hike there. What I mean is that we hiked there and we haven’t seen it. Good guess, it was the fog. It was a cloudy, rainy day anyway. By the time we reached Zamrznuté pleso, the fog was so dense that we could barely see a couple of meters ahead. Still, we’ve seen enough to tempt us back. Velické pleso, the first lake is quite pretty with huge cliffs and a small waterfall in the background. From there we were surrounded by the large, dark peaks all the way. They were partly lost in the fog and in that kind of chilly, foggy weather they really reminded us of Mordor from The Lord of the Rings. 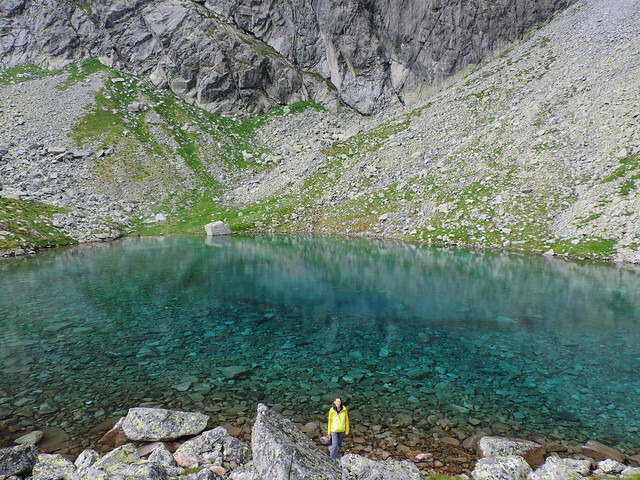 Our favorite spot was Dlhé pleso, the second lake on the way. It’s a small, narrow tarn and it’s so perfectly clear that it looks like a turquoise jewel lost in the grey landscape dominated by the large, dark cliffs. And from then on we haven’t seen much. We climbed through a steep section with the help of chains and we only suspected the depth below us. After another rainfall we hoped it would clear up but it didn’t. So we reached Zamrznuté pleso and didn’t see it in the dense fog. By that time we got enough of the weather so we turned back and struggled with the power of nature for a couple of more hours until we got back to our car on the same route. At least, on days like this we can truly appreciate the seat heating. 😛 We are sure though that we want to go back on a sunny day once. Do you have a favorite off the beaten path hike?